Commonly known as nearsightedness, myopia causes blurry vision when looking at a distance. The exact cause for myopia is not known, but it seems to be partly hereditary. If you are experiencing nearsightedness (myopia), you will have trouble seeing objects that are in the distant but will be able to see objects that are near very clearly. The reason for this is the shape of a person’s eyeball. The vision worsens if the eyeball is too long or if the cornea, which covers the front of the eye, has disproportionate curvature. For example, it’ll be difficult reading road signs while driving but easy to read books or use the computer. Furthermore, others signs include eye tiredness and headaches. There are three major treatments to myopia: glasses, contact lenses, and Lasik. Hyperopia, best known as farsightedness, is a vision condition in which objects in distance seem clearer than the objects that are near. It is the exact opposite of myopia and it can also be cured with Lasik surgery. Hyperopia is caused by an imperfection in the shape of the eyeball. Either the eye is too short or the cornea has too little focusing ability due to it not being curved enough. People suffering from hyperopia have a difficult time reading or focusing on objects that are near, which causes eye fatigue, straining of the eyes and burning. People tend to squint due to the blurred vision, which may cause headaches. At first, the problems with hyperopia affect only the near vision. As a person reaches his or her thirties or forties, depending on the amount of hyperopia, far away vision will also become affected. At this point distance vision correction will be needed as well as near vision correction. Lasik can correct the distance and the near vision problems associated with hyperopia. 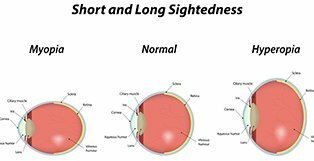 Astigmatism is an irregular curvature of the eye. With astigmatism, one dimension of the cornea is more curved than the opposite dimension. An eye with astigmatism is slightly like the side of a football versus the side of a basketball. Astigmatism is commonly present in addition to nearsightedness, farsightedness and presbyopia. In fact, most people have at least some degree of astigmatism because the front of their eyes are not perfectly round. Astigmatism is easily corrected by Lasik. Presbyopia is an eye condition that is associated with aging, and is typically first noticed around age 40-50. People who are going through presbyopia experience vision blurriness at near. Usually, people start noticing their blurred vision with fine print while reading and this disability continues to worsen throughout time. Presbyopia is caused by stiffening of the focusing lens deep within the eye. When we are young, this lens can change shape very easily to allow us to focus clearly on distance and also near objects, but as we reach early middle age this lens will not adjust as well. Presbyopia can be present with or without myopia, hyperopia and presbyopia. People typically wear reading glasses or bifocal glasses to treat presbyopia, or contacts with readers. It is inconvenient to put on and take off reading glasses every time you engage in an activity that requires them. Monovision Lasik treats presbyopia by adjusting one of the eyes for distance vision and the other for near vision. This may sound bizarre, but most of us have one dominant eye that our brains favor over the other for distant vision. Many people find monovision to be the solution to presbyopia and reading glasses that works best for their lifestyle. A few minutes of simple testing in the office can determine if monovison is right for you! Glasses and contact lenses treat vision problems; Lasik treats glasses and contacts.